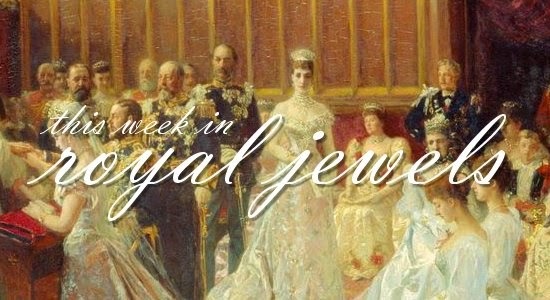 We're back with our weekly roundup of royal jewels! See what pieces were out and about this week, and vote for your favorite in the poll below! 10. Photographers gave us a good look at the Duchess of Cambridge's Kiki McDonough citrine earrings on Sunday at a ceremony marking the centenary of the end of the Gallipoli campaign. 9. In Madrid, Queen Letizia of Spain wore her cabochon ruby earrings at a drug addiction charity meeting on Tuesday. 8. Letizia selected her Links of London Hope Egg earrings on Friday for a series of audiences at Zarzuela Palace. 7. On Tuesday, Queen Mathilde of the Belgians wore diamond and pearl earrings to welcome Queen Rania of Jordan to Brussels. 6. In an event from last week's calendar, Queen Maxima of the Netherlands wore an impressive pair of spherical statement earrings at an awards ceremony in Lisse. 5. Princess Beatrix of the Netherlands wore gold jewelry on Wednesday to the annual New Year's reception for the diplomatic corps in Amsterdam. 4. For the same diplomatic reception, Maxima chose the diamond pendant earrings from Queen Juliana's collection, wearing them with citrine drops. 3. Maxima wore diamonds and emeralds -- a pair of glittering earrings and a butterfly brooch -- for Tuesday's reception at the Royal Palace in Amsterdam. 1. My list this week is book-ended by the Windsors at the Gallipoli campaign commemoration. My top spot goes, as it so often does, to Queen Elizabeth II. She wore her Pearl Triangle Brooch, which features two large pearls and a yellow diamond.